I don’t post a lot of melt and pour tutorials here as I much prefer cold process soap. 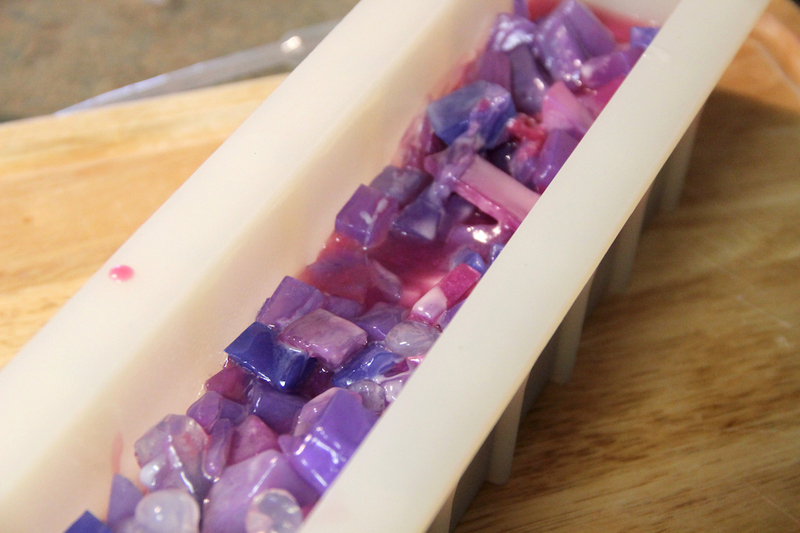 But melt and pour can allow you to be so creative and to create stuff that you simply can’t with cold process soap. I had the itch to make some gemstone soaps. They turned out great! 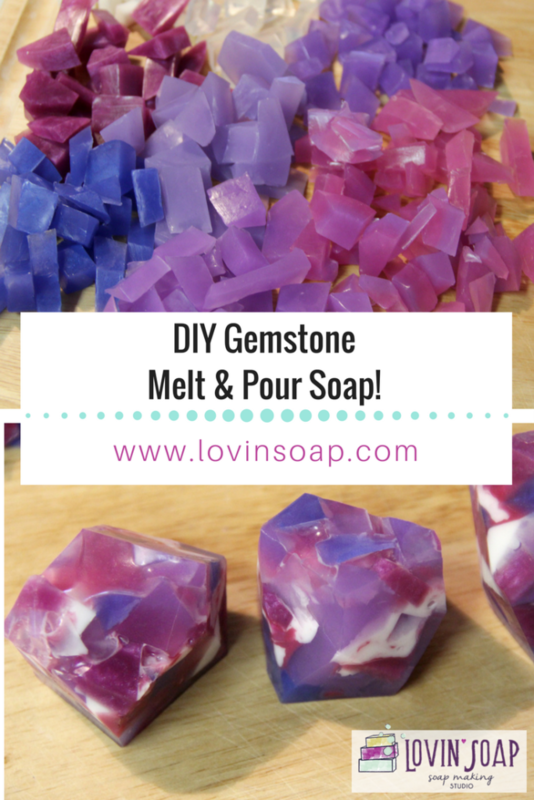 Here is what you’ll need to make gemstone soap. 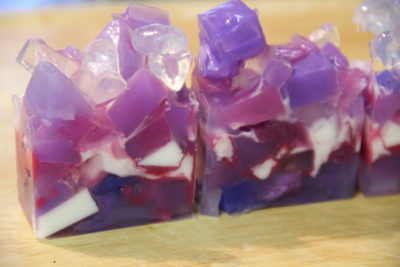 Mica – I used Flirt, Twilight and Grape Nehi from Mad Micas. Fragrance or Essential Oil – I used lavender essential oil. Step 2: Divide the remaining clear soap base into six containers (or however many colors you want). 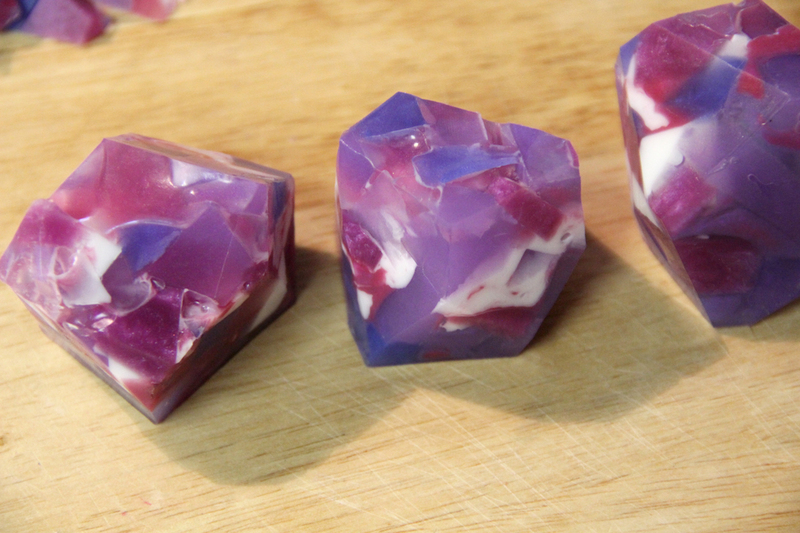 Melt these until mostly melted. Be sure to use 30 second bursts and stir. Melt just until everything is about melted. You can always re-melt if needed. 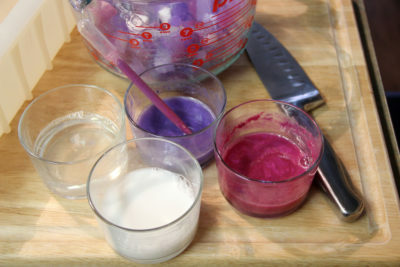 Step 3: Add color to each base. I added about 1/8 teaspoon of mica to each base (estimated). 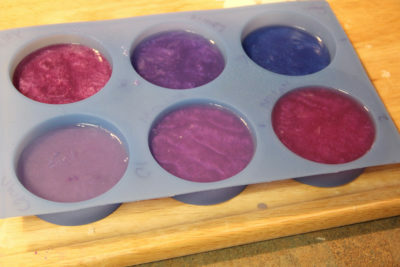 I blended the mica to get more colors. Below you can see Flirt + Grape Nehi and Grape Nehi + Twilight. Get creative! If you want your gem colors clear, then leave as-is. If you want them a tiny bit opaque, then add a tiny amount of white soap base to each one. 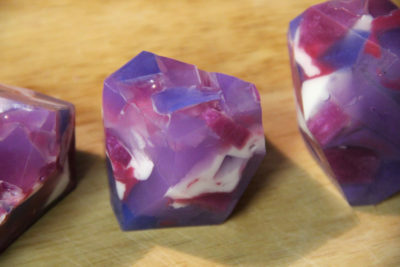 If they solidify while mixing the colorants, you can remelt. 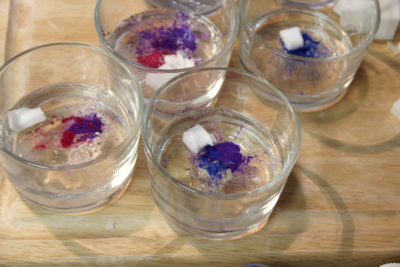 Step 4: Add fragrance or essential oil to each base. I added about 1 mil of lavender essential oil to each. Step 5: Pour into individual cavity molds (it doesn’t matter on the shape) and spray with alcohol to reduce bubbles on surface. 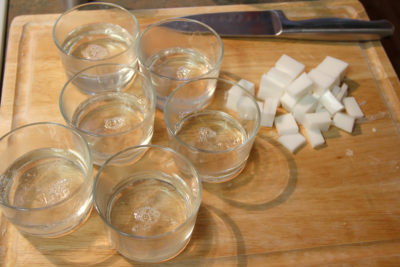 Step 6: Once completely solid, cut into small pieces. Some can be small, some can be bigger. It is completely up to you! I added some plain white and plain clear as well. Step 7: Prepare the rest of the base (that we set aside earlier). You can use it all as-is, or you can add some color like before. 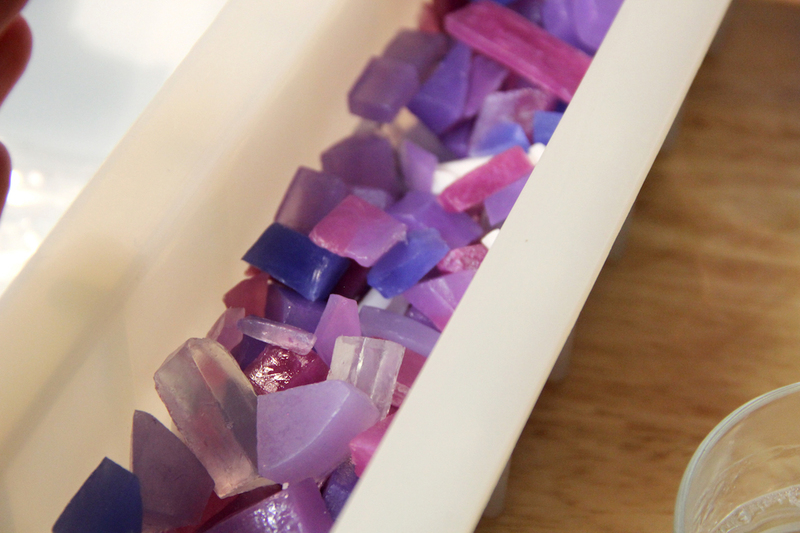 This is what we’ll be pouring over the gemstone pieces to hold it all together. 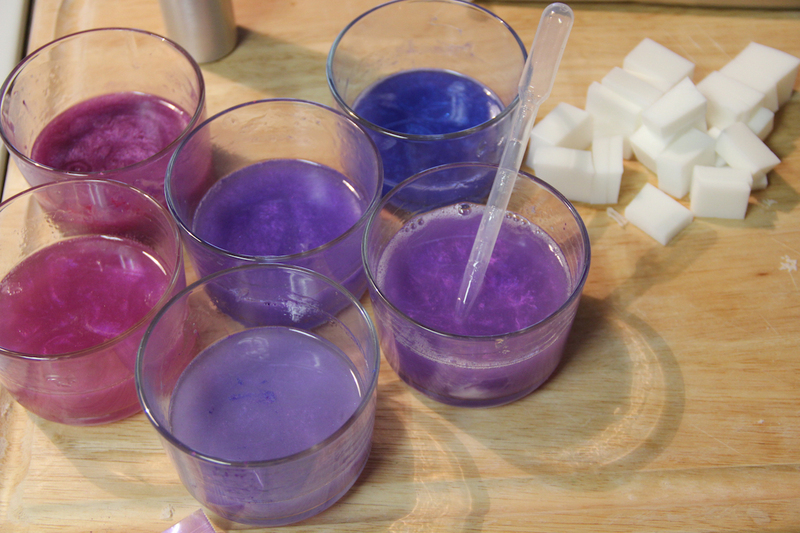 I made some clear, white, purple and pink. 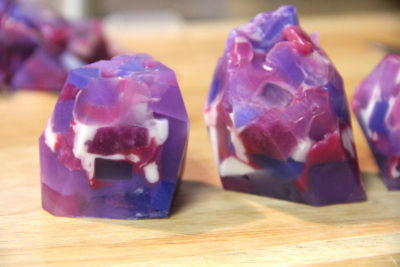 Step 8: Spray the pieces generously with alcohol and put them into your mold. 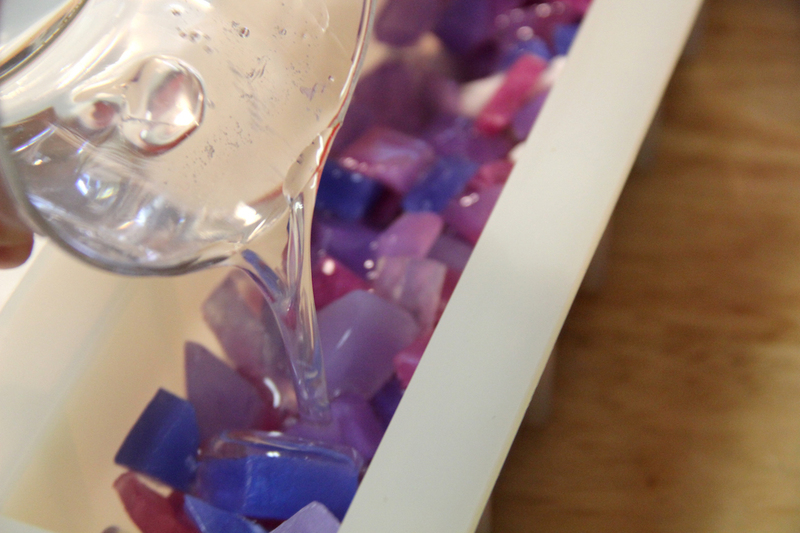 Step 9: Remelt your bases if needed. 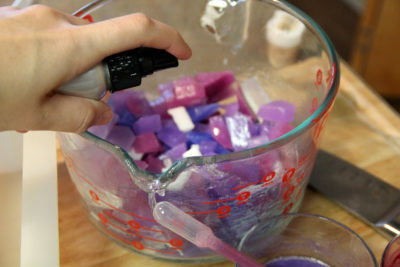 Quickly pour each one into the mold on top of the pieces. I like my base to end just above the top layer of pieces (as you can see below). But it is up to you! If you need to add more base, add more base. As you pour, the hot base melts the pieces that will be on top, sticking them together. Step 10: Allow your soap loaf to harden. Unmold and cut into pieces! You can cut your loaf two ways. 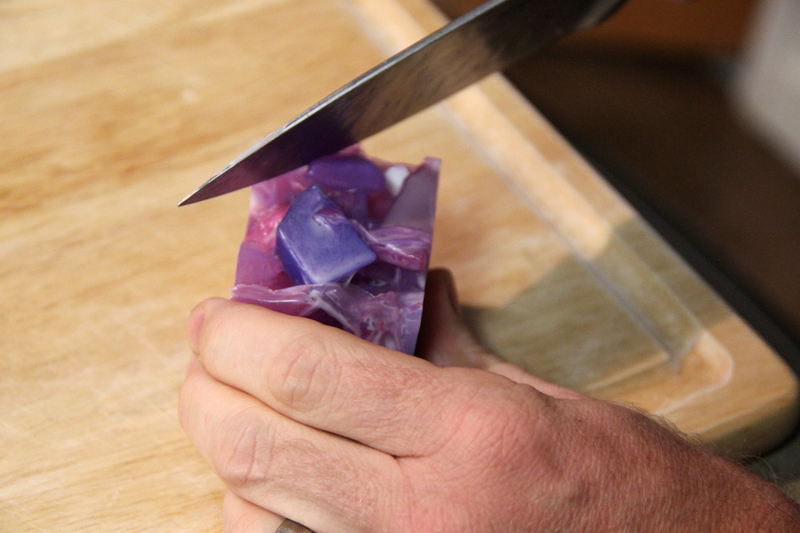 You can simply cut into slices for beautiful bars of soap! 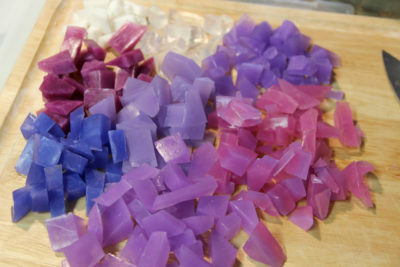 Or you can shape them into gemstones using a sharp knife! I cut the loaf into cubes. Then I simply cut off the straight edges and formed them into gemstone shapes. 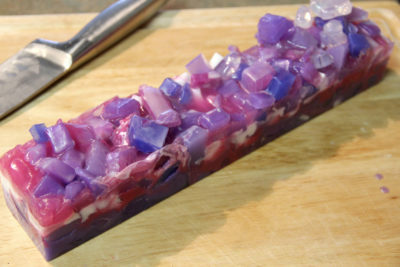 Any scraps can be embeded in your next gemstone soap. I hope you found the pictures helpful! This was a super-fun project to tackle! Thank you Amanda. Great job. I will certainly do this technique.